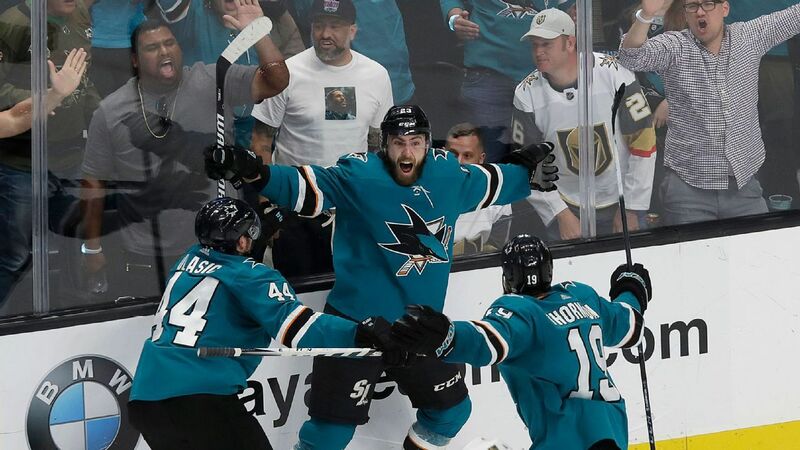 Barclay Goodrow, on his second shift of overtime, scores the game winner in Game 7 to send the Sharks to round two against Colorado and eliminate the Vegas Golden Knights. After an epic run last spring, Vegas was ousted in the first round. Here's how the Golden Knights get better for 2019-20. Matthews and William Nylander got paid. Now, it's Mitch Marner's turn, and that deal will have a big impact on Toronto's offseason. We nearly earned two more Game 7s on Monday, but alas, Nashville's watch has ended. Plus, get ready for Leafs-Bruins and Sharks-Knights. It was another great regular season for the Predators -- and a quick playoff exit. What steps should they take this offseason? Barclay Goodrow nets the game-winning goal in overtime as the Sharks knock off the Golden Knights in Game 7 to advance to Western Conference Semis.